When I retired my undead frost mage (For the Horde! ), I vowed to stay away from MMORPGs and other long-form console games for the sake of my grades, my hygiene, and my social life. I’ve been in a long-term, committed relationship with Settlers of Catan for some time now, and my favorite thing is that she always keeps things fresh while respecting the rest of my life. But I was missing RPGs something fierce, so when some of my old guildmates asked if I’d be up for Dungeons & Dragons, I could only say yes. For most of us, it’s our first time with D&D (DnD), and our first-timer GM has put in a lot of studying to make things run smoothly. It’s a lot of the same guys I played World of Warcraft with back in the day, but we interact and talk a lot more, strategizing and imagining a world out loud. We’ve done four sessions and killed a lot of goblins, with another tonight! But I’m here to talk up what I presume is the best thing to happen to D&D in the last twenty years: the marriage of Roll20.net and Google Hangouts. This is just a photoshoot hangout while my GM Phil prepares for our next encounter. Macros across the bottom; macros in action in the chat pane. Like a boss. It may seem like an oxymoron, but Roll20.net is a virtual tabletop. “Built on a powerful platform of tools, yet elegantly simple, it focuses on enhancing what makes tabletop gaming great: storytelling and camaraderie.” It’s got a library of textures, settings, and monsters so the GM can create maps, layers, and character avatars, but he still has to guide the story and remain flexible when players propose creative tactics, which keeps gaming with Roll20 authentically tabletastic. You see, the friends I play with are all over the US -- Minnesota, Texas, Seattle -- so we play in front of computers like we did with WoW. 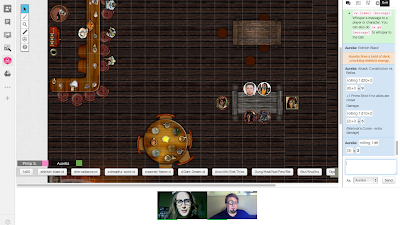 But Roll20 and Google Hangouts have made it easy for us to get together, see each other, and talk -- while at the same time facilitating our D&D experience with mapsharing and macros. Yes, sometimes you crash out and have to rejoin the Hangout, but this is a small sacrifice for the ease of use and general awesomeness that Roll20 enables. Plus it's "system agnostic" and works with tons of different tabletop RPGs. 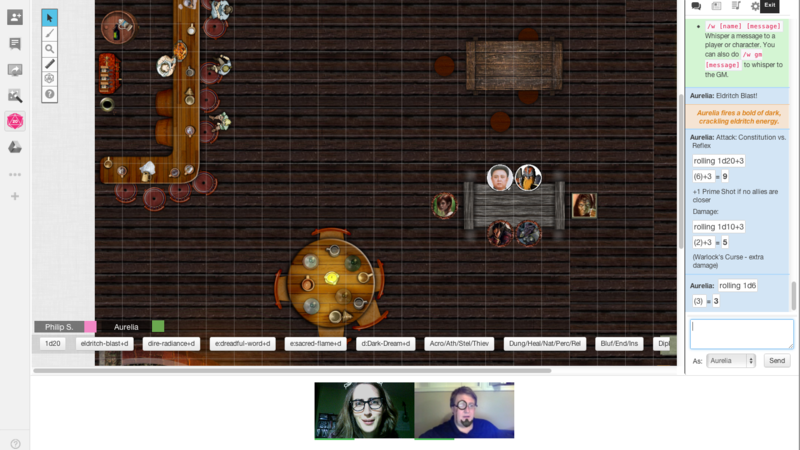 When everyone can see and hear each other, everyone's macros are set up, AND everyone is wearing a mustache with Google Effects, Google Hangouts + Roll20 is pretty much heaven on earth for D&D nerds.